Two-word descriptions and realistic art depict the ways a variety of baby animals bathe. “Snow bath” shows a young polar-bear cub enjoying a roll in the snow; across the spread, a sea-lion pup snoozes on a sandy beach in a “sun bath.” The book continues with a variety of bathing techniques, including “dust bath” (zebra foal), “mud bath” (hippopotamus calf), and “tongue bath” (tiger cub). Tildes’ sunny paintings fill each page, with a squiggly black line as an informal border. 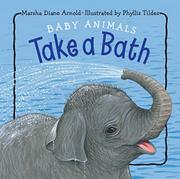 The final double-page spread reveals a white infant with brown hair and brown eyes in a baby bathtub receiving a “bubble bath!” The companion book, Baby Animals Take a Nap, follows the same formula to demonstrate how baby critters rest, often with a grown-up in close proximity. The title ends with a white baby peacefully snoozing in the crook of a grown-up’s arm, likely the babe’s father. Both offerings list the animals depicted in order of appearance in the book on the back cover. While the imagery in both may skew to the adorable, the information it presents is solid.